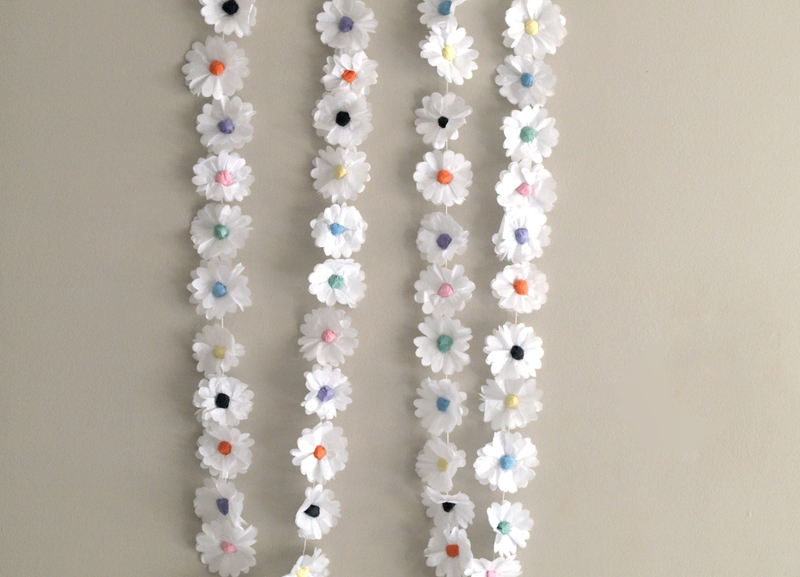 Daisy garlands bring to mind images of freedom, fun and dancing in a summer field. 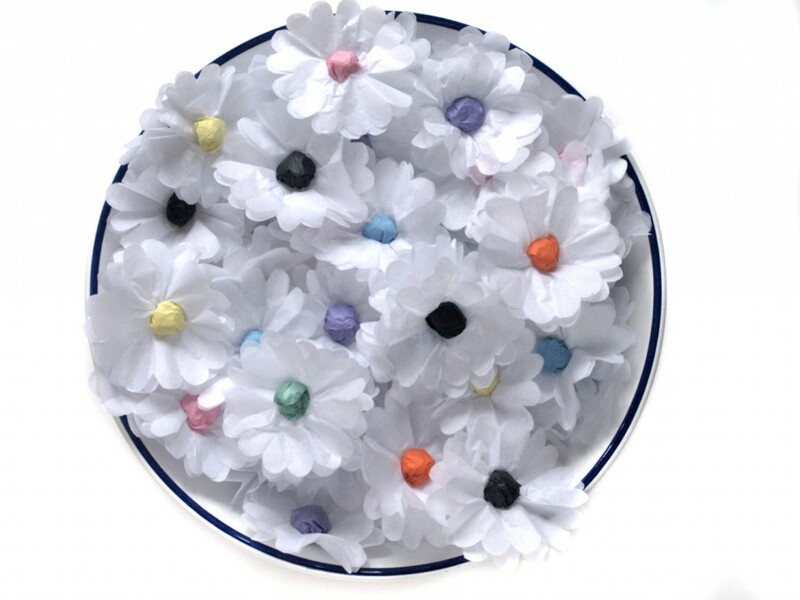 The design of these light paper daisies linked to form a delicate paper daisy chain hopefully evokes the same feelings, and can be made any time of the year. The design is made from paper squares cut from sheets of tissue paper – An ideal way of using up saved tissue paper from shoe boxes, gift bags or wrapping. They are simple to make. Follow the picture tutorial if you would like to make these yourself. 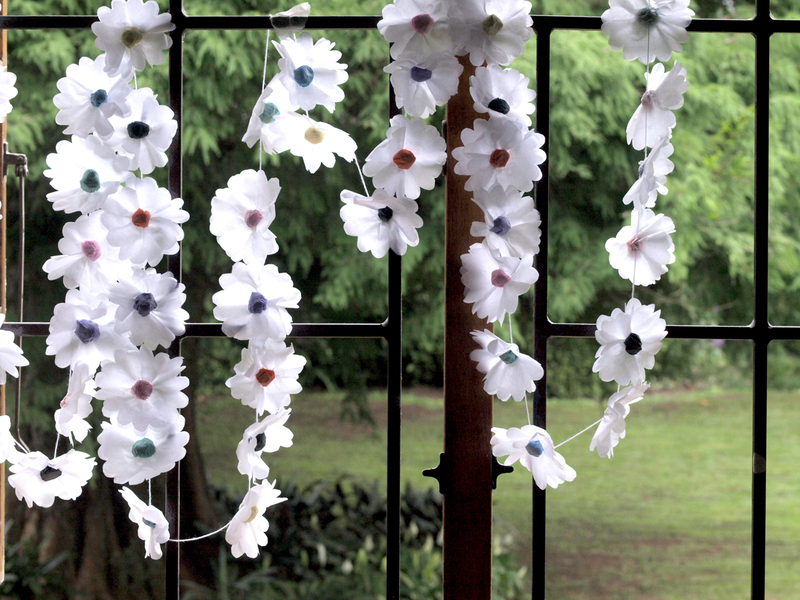 Strong cotton string to thread through the backs of the daisies to form a chain or garland. The white paper squares are folded into 16ths before cutting the rounded petal shapes out. The coloured paper squares are used for making the flower centres and are rolled in on themselves to form balls. 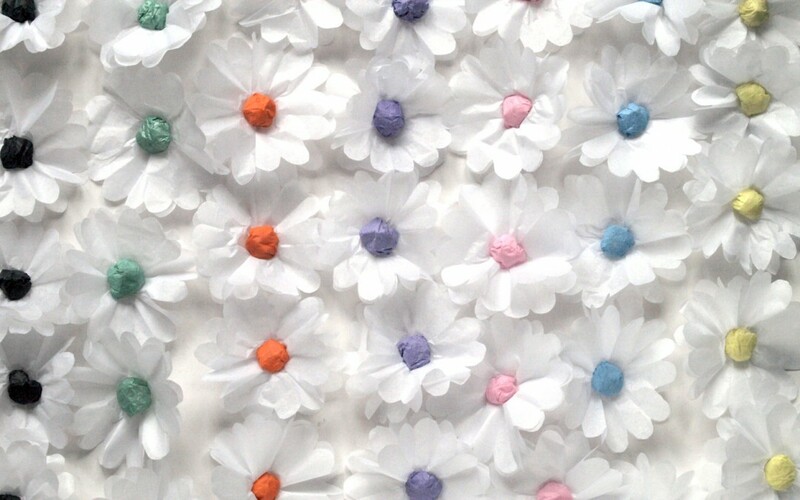 For the white petals, I used Cap tissue paper that I bought from a packaging supply company. It was quite thin, so I used a double layer for each daisy. White tissue paper bought from stationery supply shops is usually thicker – and a single layer of that would be fine. When you attach the centre balls onto the white petals with wood glue, scrunch the centre of the circle around the ball and hold in position for a few seconds for the glue to set. When finished making the daisies – turn them upside down and thread cotton string through a needle, and thread this through the backs of the daisies. A group wedding decor project with friends and family. Make a small head garland to wear to a picnic. Use as a window treatment.